SNES Donkey Kong Country 2: Diddy's Kong Quest (USA v1.1) in 39:06.68 by Comicalflop, Dooty & Umihoshi. 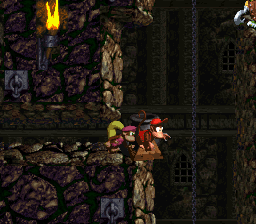 This is the any% TAS of Donkey Kong Country 2. It aims for overall fastest completion and doesn't give a flying banana about bonus rooms. Warp barrels are used whenever possible, meaning a large part of almost every stage in the first two worlds is skipped. This is an improvement of 1:38.04 over the previous movie due to some new tricks and major warping glitches exclusive to ROM version v1.1 (the previous run uses v1.0). See the submission text for a breakdown of all of the improvements. For more primate action, we recommend watching the 102% completion movie.